LABFAX volumes are purpose-designed data reference books for practicing scientists. Each book presents key information for a major subject in one place and so saves hours of searching. 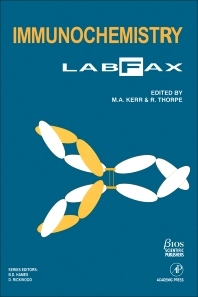 The authors and editors of each LABFAX volume have searched the original literature for the accurate data which they know the specialist needs. Immunochemistry Labfax is a detailed compendium of essential information - on plasma proteins, immunoglobulin properties and purification, antibody production, labeling and derivatization, plus data on techniques such as ELISA, blotting, and immunolocalization - needed constantly by researchers in any area of immunology and related disciplines. University of Dundee, Ninewells Hospital and Medical School, U.K.
National Institute for Biological Standards and Control, South Mimms, Potters Bar, U.K.